The Bloodhound is a very powerful, massive hound dogs. Their noses are so superb and are known for their scenting abilities. They are one of the oldest dog breeds, he is about more than one thousand years old. These breed is originated from England and later developed in US. It have been developed by St. Hubert in Belgium, later became known as St. Hubert Hounds. These dog breeds was bred to used as tracker, hunter, companion and scenthound. They are known for their scenting abilities because they have the best noses in the canine world. They has a very short and hard coat. They is large with heavy bones and long hanging ears. The head is long , the nose is large and the flews are deep. They has a wrinkled skin hanging excessively loose. The coat colors comes with black and tan, red and tawny, tawny and red, and liver and tan. The Bloodhound is extremely bright and intelligent, they always eager to learn. He is very stubborn and sensitive, so that the training can be challenge. The training should be firm and structured, yet fun. The dog owner must be have a consistent training and patience is the most important part. Grooming the short and smooth coat is easy, they doesn't require much grooming. It need to brushing with a soft bristle brush or curry comb twice weekly. The long and heavy ears should clean regularly to prevent ear infections. This breeds of dogs is an average shedder. 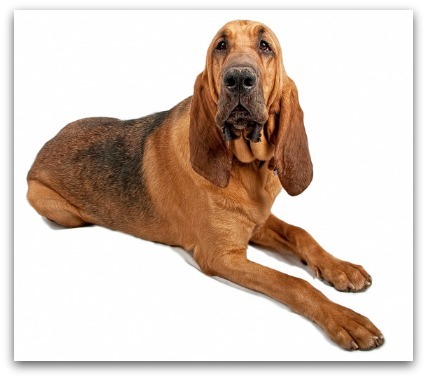 The Bloodhound is the most affectionate and loyal dog in the world, but they are stubborn! They is scare lonely, and hate to be left alone. They is gentle with children, and good with other dogs and small pets. The Canadian Bloodhound Club says " Not everyone should own a Bloodhound." They is bright, intelligent and is very eager to please his dog owner and does extremely well. They does not bark as many other hounds do.